Lefebvre was born in Tournan-en-Brie, Seine-et-Marne, on 14 March 1836. He entered the École nationale supérieure des Beaux-Arts in 1852 and was a pupil of Léon Cogniet. He won the prestigious Prix de Rome in 1861. Between 1855 and 1898, he exhibited 72 portraits in the Paris Salon. In 1891, he became a member of the French Académie des Beaux-Arts. He was professor at the Académie Julian in Paris. Lefebvre is chiefly important as an excellent and sympathetic teacher who numbered many Americans among his 1500 or more pupils. Among his famous students were Fernand Khnopff, Kenyon Cox, Félix Vallotton, Ernst Friedrich von Liphart, Georges Rochegrosse,  the Scottish-born landscape painter William Hart, Walter Lofthouse Dean, and Edmund C. Tarbell, who became an American Impressionist painter. Another pupil was the miniaturist Alice Beckington. Jules Benoit-Lévy entered his workshop at the École nationale supérieure des Beaux-Arts. Many of his paintings are single figures of beautiful women. Among his best portraits were those of M. L. Reynaud and the Prince Imperial (1874). Lefebvre died in Paris on 24 February 1911. 1870 La Vérité (The Truth) (1870), oil on canvas, Musée d'Orsay, Paris. The painting is contemporary with the first small scale model made by Lefebvre's fellow-Frenchman Frédéric Bartholdi for what became the Statue of Liberty, striking a similar pose, though fully clothed. ^ a b c d "Art Renewal Center Museum™ Artist Information for Jules Joseph Lefebvre". Art Renewal Center. ^ a b c d "A One-Picture Painter". Evening News (13, 776). New South Wales, Australia. 3 August 1911. p. 6. Retrieved 6 March 2017 – via National Library of Australia. ^ a b Collier, Peter; Lethbridge, Robert (1994). Artistic Relations: Literature and the Visual Arts in Nineteenth-century France. London: Yale University Press. p. 50. ISBN 9780300060096. ^ a b Oxford Art Online, "Lefebvre, Jules"
^ Kathleen Luhrs, American Paintings in the Metropolitan Museum of Art, 1980: "... on to Paris and studied for a year at the Académie Julian under Gustave Boulanger and Jules Lefebvre." ^ Carrie Rebora Barratt; Lori Zabar (1 January 2010). American Portrait Miniatures in the Metropolitan Museum of Art. Metropolitan Museum of Art. pp. 244–. ISBN 978-1-58839-357-9. 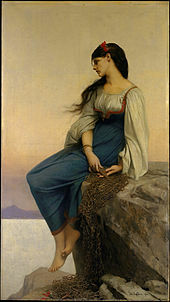 Wikimedia Commons has media related to Jules Joseph Lefebvre.